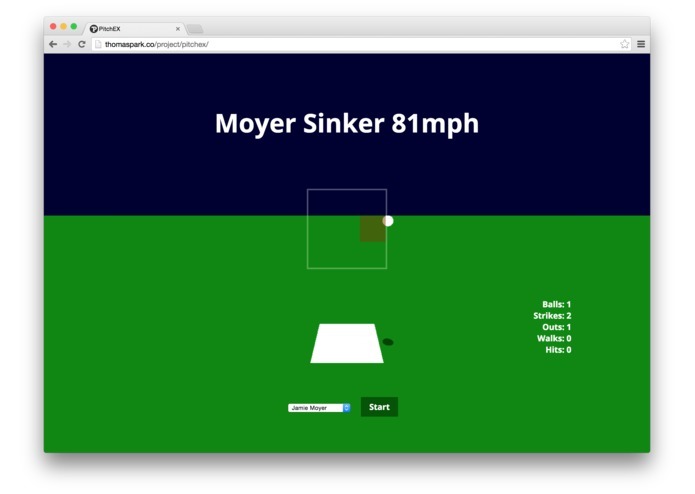 We wanted to give people a way to experience how hard MLB pitchers throw and how little time batters have to react. Using PITCHf/x data, we built models of several MLB pitchers' styles including situational pitch selection, velocity, movement, and release point. Then we used these models to create a simulation of baseball pitches within a 3D environment. Finally, we built a minigame where you're put in the batter's cleats. Predict where the next pitch will be thrown, and mouse over a quadrant of the strike zone to position your bat there. I worked on data acquisition and probabilistic aspects of the mini-game, as well as on the physics of ball movement. I learned a lot about data availability in baseball. It was difficult to understand the pitch f/x data; thank goodness for high school physics!